Liberal foundations financing a nonprofit news venture that is reporting on donations made by the Koch Brothers to colleges are also financing on-campus groups protesting the Kochs’ donations. The same foundations have also spent billions backing educational initiatives of their own that frequently promote left-wing policy agendas. Despite that spending, their grantees say that conservative and libertarian philanthropists are uniquely determined to advance their own views on campus at the expense of academic freedom. The Center for Public Integrity, a nonprofit investigative news venture, on Friday published a story highlighting libertarian philanthropists Charles and David Koch’s contributions to, and involvement in, programs at a handful of universities that seek to promote free market values and train students for public policy-focused careers. Headlined "Koch brothers' higher-ed investments advance political goals," the story detailed the Kochs’ grants to colleges and universities, that, reporter Dave Levinthal wrote, are "now a critical part of their broader campaign to infuse politics and government with free-market principles." According to Levinthal, Koch-backed foundations provided $19.3 million in funding for colleges and universities in 2013, a $6.6 million increase over 2012. "Funding—as well as pushback against it—is increasing," he wrote. One group committed to such "pushback" is UnKoch My Campus, which immediately picked up on and promoted CPI’s story. Its publication came just days before UnKoch’s planned "day of action" this Thursday to protest what it says is the Kochs’ undue influence on the curricula and staffing of those programs. 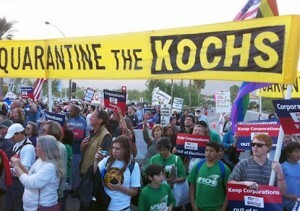 UnKoch says its effort is less about the Kochs per se than the influence of the wealthy on American higher education. "As unbelievable as it seems, multi-billionaire industrialists (through the power of their purse) are using your university to push their own philosophy, agenda, and economic interests," the group’s website says. The tone of that complaint is content-neutral, but UnKoch, as its name suggests, is focused exclusively on the influence of conservative and libertarian university donors. "The Kochs and their vast network of front groups they fund work tirelessly to undermine the issues many students today care about: environmental protection, worker’s rights [sic], healthcare expansion, and quality public education, to name just a few," the website says. UnKoch’s views reflect those of the groups backing the campaign: environmental giant Greenpeace; Forecast the Facts, a climate-focused project of the left-wing Citizen Engagement Lab; the Center for Media and Democracy, another nonprofit news venture; and the American Federation of Teachers. Those groups receive significant funding from the same foundations that finance CPI’s reporting. The Park Foundation, the Ford Foundation, the William and Flora Hewlett Foundation, the Rockefeller Brothers Fund, the John D. and Catherine T. MacArthur Foundation, and the Foundation for an Open Society have all granted money to CPI and at least one of the groups behind the UnKoch effort. These groups are also heavily involved in education philanthropy: Together, those six foundations have doled out more than $4.2 billion in related grants, including nearly $270 million in 2013, according to the nonprofit research service Foundation Search. Levinthal’s story touched on education giving by liberals such as George Soros, the billionaire investor behind the Open Society Foundations. But it did not flesh out the full scale of those investments, and downplayed their political nature despite evidence that foundations bankrolling the UnKoch campaign are also funding university programs with explicit policy goals. The Ford Foundation, for example, gave $150,000 to the University of California system in 2013, the latest year for which annual tax filings are publicly available, "for the Institute for Research on Labor and Employment to conduct, analyze, defend, and disseminate research on the economic impact of raising the minimum wage." The MacArthur Foundation gave $25,000 to DePaul University that year "to support a meeting to plan for the possibility of implementing a new federal immigration law in Illinois." Hewlett gave $50,000 to the UC system for a project focused on "achieving clean energy goals." The Park Foundation, which finances a host of anti-fossil fuel groups, has been deeply involved in funding research at Cornell University that seeks to undermine the case for hydraulic fracturing and expanded natural gas development. Park gave Cornell $60,000 to continue that work in 2013, the same year that it reported financing an "opposition research" project at Greenpeace. Levinthal followed up his reporting with a story detailing the work of six foundations with ties to the Kochs. Together, the foundations reported net assets of $463 million in 2013. In comparison, the six aforementioned foundations backing CPI and the groups behind UnKoch reported combined net assets in 2013 of more than $31 billion. Those foundations have very broad grant portfolios, even in their educational giving. However, they also support many of the same types of programs that the Kochs do, with similarly ideological or policy-focused objectives. Levinthal writes that the Kochs’ giving will "build a ‘talent pipeline’ of libertarian-minded students." Little attention is paid to the fact that this is exactly what the foundations backing CPI and the groups behind UnKoch are also trying to do. Ford donated $470,000 to New York University in 2013 "to launch the Ford Foundation Law School Public Interest Fellowship Program to place first and second year law students as summer interns with foundation grantees working on issues of social justice." The same year, it gave $100,000 to Yale University "for Yale Law School to develop a Center on Immigration and Migrants Rights that would train a new generation of leaders." Hewlett donated $150,000 to Stanford University in 2013 to support the Senator Bingaman Distinguished Fellowship at Stanford’s Steyer-Taylor Center for Energy Policy and Finance. That center is named for billionaire Democratic donor Tom Steyer and his wife. Steyer was by far the largest donor to outside political groups during the 2014 election cycle, eclipsing the Koch Brothers. His super PAC, NextGen Climate Action, donated $100,000 in September to the Citizen Engagement Lab, one of the groups behind the UnKoch effort, according to Federal Election Commission records. UnKoch referred questions about its activities to Greenpeace spokesman Connor Gibson, who rejected any parity between university donations from the Kochs and similarly ideological donors on the left. "[Charles] Koch's is unique in his hostility toward academic freedom," he wrote in an email. Gibson for the most part declined to directly address questions about the UnKoch effort, and demanded to know whether the Washington Free Beacon is "contracted to write defenses of [the Kochs] every time another scandal breaks." Instead, Gibson cited CPI’s reporting, which he said demonstrated that hostility. Gibson took to social media immediately after Levinthal’s story went live, tweeting and retweeting links to the piece 13 times on the morning of its publication. UnKoch also promoted it on its website. According to one of its institutional donors, CPI’s reporting strategy was geared toward effecting policy change by providing ammunition to groups that share its general ideological outlook. The John S. and James L. Knight Foundation in 2010 lauded CPI’s ability to get its "reporting into the hands of … policy or advocacy groups," which then "use CPI information to effect social change." "The audiences who have engaged with CPI’s work are expected to use it to hold institutions and people accountable," Knight wrote. "When this process works, the eventual impact is social change in the form of policy or systems change." The evaluation recommended that CPI tailor its reporting to groups and individuals interested in changing public policy. "Part of this equation is about what stories are pursued (i.e., the point above about making sure they link to the public or policy agenda). The other is about making sure the people who matter know about the stories and use them," Knight wrote. "Ideally, those two parts of the equation will be linked—the stories pursued should be based, at least in part, on the interests of those who will use them." Levinthal said in an email that his story was not written with any policy change in mind. "[CPI’s] work is not, specifically or generally, geared toward affecting university or public policies," he wrote. "It is very much geared toward explaining to readers how some of the most powerful political donors use their money on the nation’s college campuses." He noted that the story was a culmination of eight months of reporting, and was not scheduled to coincide with this week’s anti-Koch campus activism. "I was aware of the anti-Koch activists’ ‘day of action’ and it didn’t factor into when the story was published," Levinthal wrote. "The Koch brothers’ scheduled appearance on MSNBC’s ‘Morning Joe’ on Tuesday for a rare double interview did factor into the publication date to some extent: It’s a great news peg, and I preferred that the story ran before that interview than after it." Other media outlets that have partnered with CPI amplified Levinthal’s story. Al Jazeera and the Atlantic both republished the piece. In a Friday email obtained by the Free Beacon, a CPI employee pitched the story to a number of journalists. Among them was a reporter for the Wichita Eagle, the Kochs’ hometown newspaper. Lachlan Markay received a $1,200 stipend in 2009 from the Institute for Humane Studies.